If you have a lot of duplicate photos stored on your device storage, then it’s time to find and delete these unnecessary files using best duplicate photos remover tools. These tools work on advanced algorithms to help de-duplicate your Android device effectively. Let’s discuss some of these smart solutions here. Duplicate Photos Fixer offers flexible scan modes to help you de-duplicate your photo collection effortlessly. 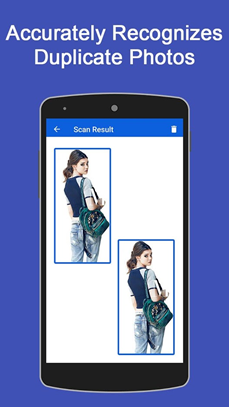 These scan modes include full scan, camera images and select folder. Once it completes scanning your device storage, it will display results in groups for easy removal and management. Further, it allows you to preview files before deletion to avoid deleting important files. It displays auto-mark results to save your time & efforts. For better results, it allows you to set criteria for accurate results. Qupiq: Qupiq offers a best duplicate photo management solution to help you de-duplicate your photo collection in a jiffy. You can use this tool to scan, find, compare and remove all identical images on your Android device. You can use this tool to find you Kodak moments instantly and delete all duplicate copies. It helps you automatically find and group all similar images in a matter of seconds. It works on interactive UI to help you find and delete all identical files automatically. Here, you simply need to launch the program and easily compare the identical photos to get rid of them. It works on ultra-fast and accurate algorithms that not even require Internet to run. 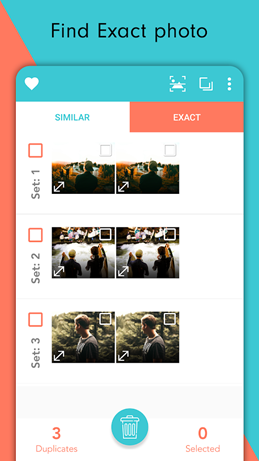 Remove Duplicate Photo: Remove Duplicate Photo app works on smart techniques to help you find all visually similar and exact looking photos on your Android device. Here, it performs a deep scan of your device storage to find and delete duplicate photos even from the darkest corners of your device storage. Using this smart solution, you can recover lots of storage space effortlessly. It is also helpful to speed up your device performance significantly. In addition to deleting duplicate photos, it also helps you find and clean identical videos, audio files, documents and more. You can also use this tool to recover photos whenever you want. Duplicate File Remover: Use this powerful solution to get rid of all types of duplicate files. Using this tool, you can find remove duplicate photos, audio files, videos, documents and more. Using this free optimization tool, you can easily find and delete duplicate photos on your device to recover valuable storage space. It also helps you boost your device speed significantly. It works on super-fast scan engines to perform deep search & cleaning of your device. Once it completes scanning your device, it allows you to delete selected photos or set of images instantly. Above that, it will keep one copy of every file even when you have deleted the entire set of selected files. Duplicate Photos Remover 2018: Use this powerful tool to scan your device’s internal storage and SD card to find and delete all identical photo files. You can also use this tool to scan your external devices whenever you want. It helps you organize & optimize your device storage for better speed & performance. Using this tool, you can easily manage & recover device space automatically. Once it scans your device storage, it will auto mark all duplicate files & photos to easily manage them. Here, it will keep one copy of every file even if you delete the entire set of images. This powerful takes few seconds to de-duplicate even the largest photo collection. 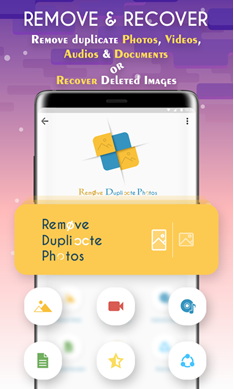 Remo Duplicate Photos Remover: This powerful productive app is designed to locate, display and delete all identical photos on your Android device. While searching for duplicate photos, it will display all similar photos taken in burst mode or HDR photos, even resized and all similar images on instant messaging apps. It runs on Remo’s proprietary intelligent de-dupe algorithms to help you scan and display identical images in sets. Here, you can delete the entire set of duplicate files or set of images as per your need. Here, it will keep one copy of every file even if you delete the entire set of images. It offers smart de-dupe modes to help you find similar and exact match images. This smart tool performs scanning in the background to save your time. Duplicate Photo Finder: Duplicate Photo Finder performs two different scans to find and similar and exact match photos on your device. You can use this advanced duplicate image remover app to find and delete all identical photos instantly and accurately. Once it completes scanning your device storage, it will display results in sets where one photo will be unselected to delete. You can use this powerful tool for instant and effective results. So, these are some of the best duplicate photos remover tools you can use to de-duplicate your photo library on Android device. If you know more such tools, then feel free to comment below.